BeautifulNote is a notebook designed to focus on writing. · Easy to edit text,over 30 fonts and color to choose. · Allow insert photo in text. · Allow insert map in text. · Set passcode to protect your note. · iCloud backup and restore. 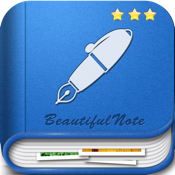 BeautifulNote will NEVER add In-App Purchases and iAd Advertising, We will do our best to keep the best writing experience for you.